Manna is living with her husband Denny, their cute son Samuel, and their lovely Golden Retriever Coco. 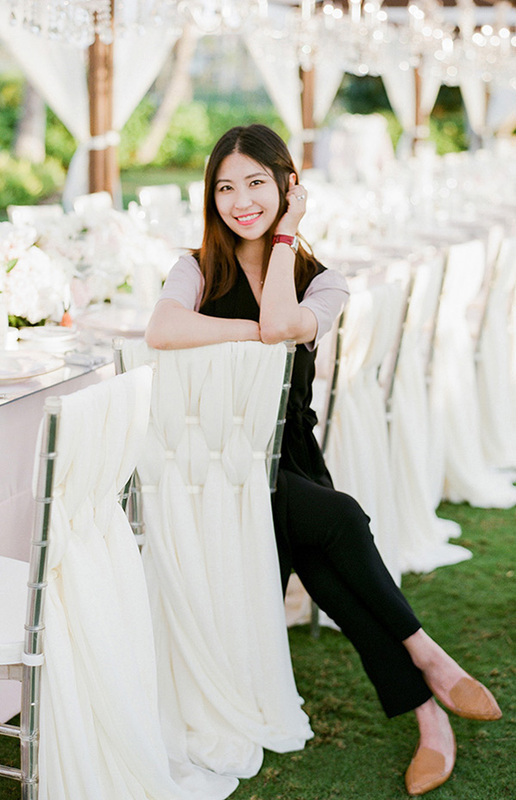 As a lover of reading, painting, and traveling, she is also the founder, chief planner and lead designer for all of the weddings and events produced by Manna Sun Events Group. With a master’s degree in Communications and a background in event management for large scale events, Manna has planned and designed more than three hundred weddings and events in her past seven years in the industry. You can find her beautiful works in San Francisco, Los Angeles, San Diego, Seattle, New York City, Chicago, Philadelphia, Columbus, Austin, Hawaii Islands and etc. Many of her works have been featured on various wedding magazines and blogs, and she was also an invited guest of China Global Television Network (CGTN). She believes her attention to details, her focus on intimate client experience, her skills, creativity and personality are the keys to her success. Based in San Francisco Bay Area, Manna Sun Events is a full-service wedding and event planning, design, styling and coordination company with plenty of experience in the industry. We service weddings and events internationally, and we pride ourselves on creating phenomenal guest experience through creating personalized planning and design concepts and details. No two couples are the same. We believe in customizing each wedding and event package to meet our clients’ exact needs, and we listen to their personalized needs, sort through their ideas, define visions, and work with them to create weddings and events which are completely reflective of their personal taste and personalities. Planning and designing a wedding or event can be both a stressful and overwhelming time. If you were busy professionals and lack the time to do the intensive research and creative design that planning a successful wedding or event requires, we are here to help! Our consultants, planners, designers, and coordinators are dedicated professionals with many years of event planning and execution experience. We are available to you throughout the entire planning process, or just for the “day of”. We manage the multiple components of your wedding and event by your side every step of the way, and ensure that we can maximize your budget to the fullest. When you hire Manna Sun Events as your wedding and event planner, we firmly believe that we will boast a stellar reputation and the best vendor relationships, and consistently exceed your expectations. Just sit back and enjoy your special day knowing that every detail has been incorporated and accounted for. We promise you our commitment to excellence and we guarantee your wedding or event will absolutely be a unique and exceptional one based on our amazing inspirations! Last but not least, our new office in Canada is opening in July 2019! We can’t wait to serve more newlyweds in the north America!